Perhaps it was luck, or maybe it was the work of the Kitchen Gods. 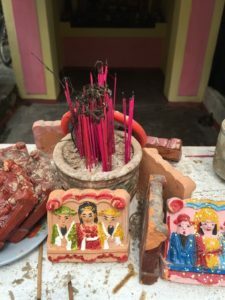 After all, it was during Tet—the Vietnamese New Year—when the Kitchen Gods report the doings of mortals to the ruler of the spirit realm. 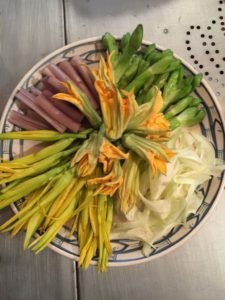 Whatever the explanation, it was serendipitous that, after five weeks researching edible flowers in Southeast Asia, we stumbled upon a brand-new restaurant in Ho Chi Minh City named Chi Hoa. 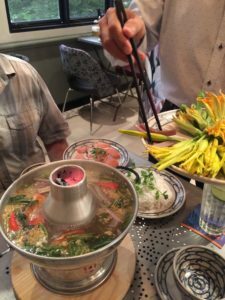 Hoa means “flower” in Vietnamese and the first thing we noticed on the menu was lau hoa, flower hot-pot. This was where we were meant to be. His statement echoed precisely what we had learned in our research about the power of flowers in relationship to the food we eat. Everywhere in the world, both historically and in contemporary cuisines, the use of flowers in food has been special and exceptional and always included with intent and care, never accidentally or without purpose. Flowers are used in food by someone who cares about you and/or the beauty of what you are about to eat. Stunning fresh blossoms of squash, day-lilies, white so dua flowers, lotus stems, and yellow velvetleaf buds made up the floral ingredients in our flower hot-pot, cooked in a light, pineapple soup base that included chunks of salmon. What makes flowers, which often have only a hint of taste or flavor, such powerful ingredients in culinary traditions throughout history? How is it they have been used by the first primitive foragers all the way up to sophisticated court chefs all around the world? Why are edible flowers having such resurgence in cuisines today, from proponents of the farm-to-table movement to contemporary “kings” of molecular gastronomy? 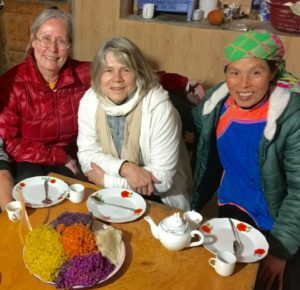 Come back again and join us on the Edible Flower adventure- next stop, Sapa Vietnam for seven-color rice and artichoke tea. Copyright © 2019 Constance Kirker & Mary Newman. All rights reserved.